Wow! It’s been a full week here at General Sarge HQ with so many great things going on. We’re all pretty much on the verge of busting some of our stuffing out with excitement! We are thrilled with the support we’re gaining for the Gift-A-Bear Campaign. Today we say a big “Two paws up” to Tom, his wife Pam and all the staff at their Maggie Moo’s Ice Cream and Treatery in the food court at Eastview Mall in Victor, New York. 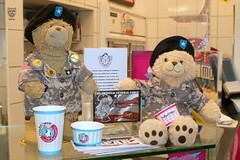 As you can see General Sarge paid a visit to their Maggie Moo’s location to help promote their fundraiser in support of the Gift-A-Bear Campaign. While General Sarge’s visit was quick, Tom and Pam have their very own Military Build-A-Bear – SFC M.M. (Sergeant First Class Maggie Moo) – SFC M.M. is enjoying meeting all the great people at the mall as they drop a donation into the box. Tom and Pam’s Maggie Moo’s is located in the food court at the Eastview Mall. They have a great location and great ice cream! I have to admit after visiting Maggie Moo’s for some ice cream, General Sarge did make me do some extra push-ups. But it was worth it! The Maggie’s fudge with strawberries I had was incredible! I also think General Sarge did sneak in a taste. I’m sure I saw some evidence of chocolate on his paws. The first time we met Tom and Pam we hit it right off. We also have something in common – a son serving in the military. Tom and Pam’s son Brandon is a Reservist in the Air Force and he just recently deployed to Afghanistan. We thank Brandon for his service and wish him safety while he’s deployed. If you’re in the Victor-Rochester, New York area and you visit Eastview Mall please stop by Maggie Moo’s and thank them for their support 0f the Gift-A-Bear Campaign. You can also get a high five from SFC M.M. when you put a donation into the box he’s sitting beside too. This entry was posted in 2011 General Sarge Posts, Fundraisers and tagged Build-A-Bear Workshop, General Sarge, Gift-A-Bear Campaign, Military, New York, Teddy Bear. Bookmark the permalink. The Maggie Moo’s Ice Cream is definitely worth the extra push-ups! Have never met Pam but know that Tom has been fantastic and has helped us out with ST BALDRICK’S over the years that we have done that. He is a great guy and has been so supportive when it comes to many charities in the Rochester area. In the words of General Sarge–two paws up and the ice cream is definitely worth the extra push-ups. We had a great visit with Pam when we stopped by the store for some ice cream and to take the picture. Of course Sandra and Pam really hit it off since they’re Mom’s with boys in military service. General Sarge, I hope you lead by example and did some push ups yourself for the chocolate on your paws!! I certainly do lead by example. Actually, I show all the lower rank people how to do real push-ups just like SSG Dillman. I do them with just ONE paw like SSG Dillman did in his Day 141 PT Test for me. The next time I’m working out I’ll be sure to have a picture snapped. Yummy destinations are fun to go and visit aren’t they!! So happy to hear all about Maggie Moo’s and how many people are reaching out to help General Sarge assist military families. Good to hear you both did your pushups, daily exercise is important to keep fit and strong.